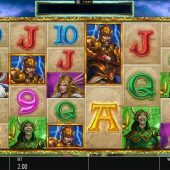 Thunder Strike Megaways slot is the sixteenth game of this genre to be released since BTG produced the first, Dragon Born. This is quite different the other Blueprint Megaways slots in that unlike Vikings Unleashed or Genie Jackpots Megaways, there isn't actually a triggered bonus round. The theme is similar to the former with a longship in a bay and thunderstorm in the background sky and we share too the dramatic music and sound effects of that game sometimes. 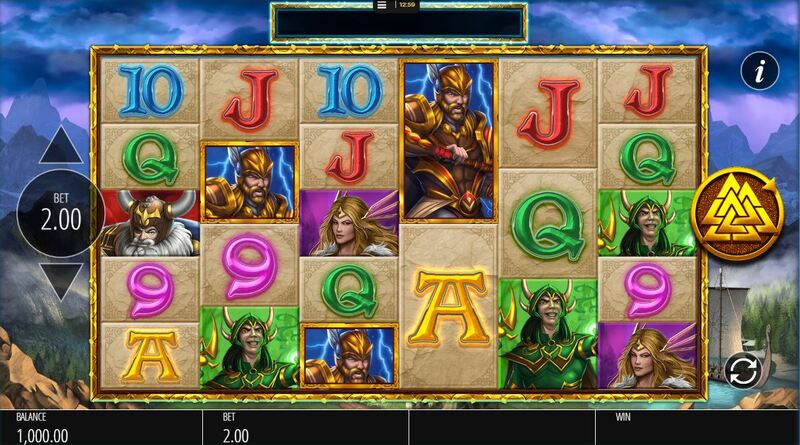 So are we to see a merciless strike on our bankroll here or will Thor's thunder help us to victory? We only see a maximum of 5 rows on each of the 6 reels of Thunder Strike Megaways slot therefore the most ways to win on any spin is 15,625 - but we do get both-way pays here! There are no scatters but we get the mystery stacks as with Diamond Mine, in the form of Yggdrasil The Tree of Life. Wilds appear in the shape of Thor's hammer on the centre 4 reels and these are crucial to the modifiers and features as we'll see in due course. Now the pays for 6-of-a-kinds are 50x stake for the Winged Helmet Warrior, 10x for the Horned Helmet Warrior, Loki or Valkyrie pay 2x with six card values of either 1.5 or 1x for a full way of 6. You only need pay 10 coins to spin too. Any Wild Hammer landing on reels 2,3,4 or 5 will expand to fill the reel and award a respin after any pays are counted. The reels then respin with the Wild reel held and showing a multiplier of how many rows the reel had when it landed, i.e. 2 to 5x. If you get another Wild, another respin is awarded after pays are added. The maximum is all 4 Wilds at 5x for a 625x multiplier! For every win of 5x bet or above, usually had after the Wild respins or Mystery symbols, you can go and swap for a Megaspins gamble wheel. You get a spin on the ladder for every full multiple of 5x your win was. You can gamble the Megaspins to a maximum of 25. On the right of the gamble wheel is a cash ladder. You can stop at any time and take either the cash ladder which is 10x bet for every step or the Megaspins. In the Megaspins you are likely to see far more Wilds and mystery stacks. You may win more or less than your cash ladder amount, and any lost gamble loses all your spins or cash.